Affordably outfit interior doors with this lockable lever set from Defiant. The Naples Privacy Lever easily mounts to doors 1 3/8-inch to 1 3/4-inch thick with the included hardware. Perfect for bedroom and bathroom doors beyond which privacy is sometimes desired. Provided with this set is an adjustable backset and interchangeable faceplates for drive-in and traditional installations. This sturdy lever nicely coordinates with other fixtures in your home for a cohesive look. A lifetime warranty ensures that this device will withstand frequent use. 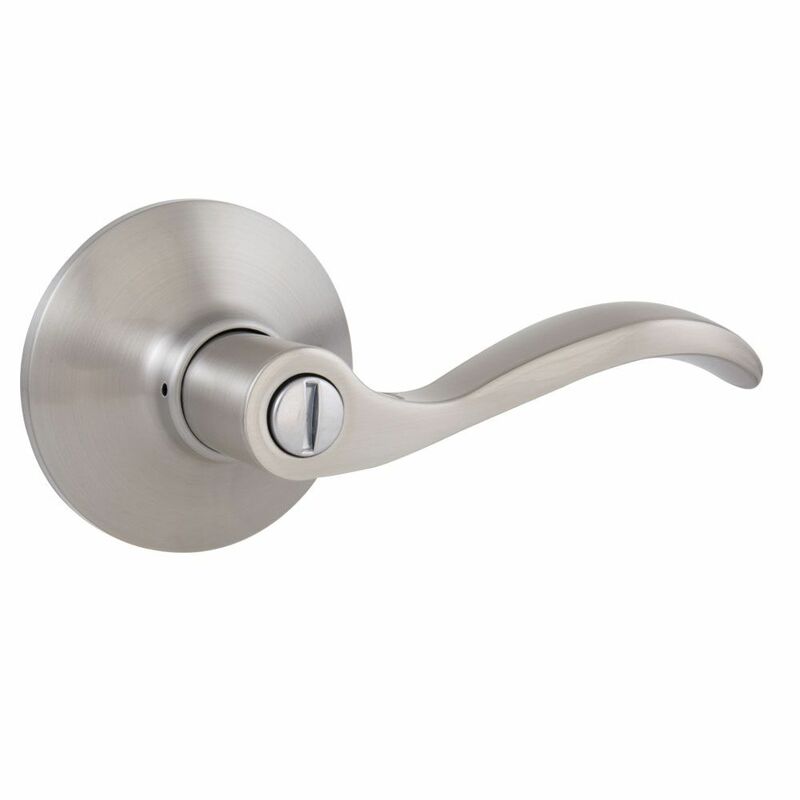 Naples Satin Nickel Privacy Door Lever Affordably outfit interior doors with this lockable lever set from Defiant. The Naples Privacy Lever easily mounts to doors 1 3/8-inch to 1 3/4-inch thick with the included hardware. Perfect for bedroom and bathroom doors beyond which privacy is sometimes desired. Provided with this set is an adjustable backset and interchangeable faceplates for drive-in and traditional installations. This sturdy lever nicely coordinates with other fixtures in your home for a cohesive look. A lifetime warranty ensures that this device will withstand frequent use. Naples Satin Nickel Privacy Door Lever is rated 4.6 out of 5 by 156. Rated 5 out of 5 by Gman from Seems to be well constructed. (heavier, ergonomic and smooth action). I replace my 3rd Kwickset ... Seems to be well constructed. (heavier, ergonomic and smooth action). I replace my 3rd Kwickset lever lock of almost identical appearance and they only lasted 10-12 years before becoming unusable. I've only had the Defiant bed/bath lock a few weeks, so I cant really comment on longevity. Very pleased with the look and smoothness of operation. I would definitely purchase more for replacements and would purchase for future new construction. Rated 5 out of 5 by HomeDepotCustomer from Excellent quality!! I bought 10!! !Beautiful product!!... Excellent quality!! I bought 10!! !Beautiful product!! Rated 5 out of 5 by TC from Excellent doorknobs. Excellent doorknobs. Rated 5 out of 5 by Captainalfie from Simple lines and nice finish. We like the uncluttered look and satin finish. It was easy to install and behaves smoothly. Rated 1 out of 5 by Frosty from Read the package very carefully! It is a "privacy" lever. NOT a locking handle. I'm not even sure... Read the package very carefully! It is a "privacy" lever. NOT a locking handle. I'm not even sure why this product is manufactured in the first place. You can unlock it from the outside with just your finger. I see a key hole from the outside cylinder. In order for you to access the door in case of an emergency, do you require a key to unlock the door from outside? Thank you for your question. The outside lever has a slot on it that appears to be a keyway. Simply insert a small flat object such as a coin into the slot and twist 90 degrees. This should unlock the lever from the outside. If you should still have any questions, please contact our customer service team at 1-877-663-5625, and an associate there will be happy to assist you. Thank you for choosing Defiant.